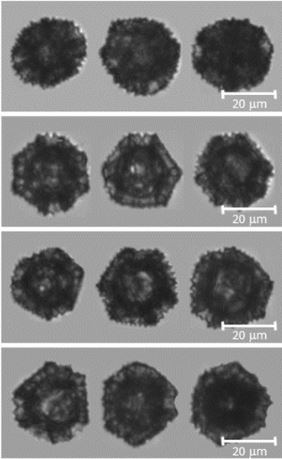 In this study, the FlowCam was used, along with other imaging technologies, to assess the preservation of the dandelion SEC morphology during the extraction of inherent proteinaceous materials. The size and morphology was characterized by their distribution of diameter, circularity and aspect ratio. The study concludes that dandelion SECs could be a promising shell material for microencapsulation and drug delivery. Pictured at right, dandelion sporopollenin exine capsules as imaged by the FlowCam. Read the full paper about the methodology, technologies used, and promising nature of dandelion SECs as a potential candidates for the development of drug delivery systems.